Cost-effective performance and security testing system for enterprises and service providers. Flexible operation modes from 1 standalone device up to 8 devices combined in Test Center mode. 40 GE QSFP+ interface support on 3000E (with 4x 10 GE SFP+ split mode). 100 GE QSFP28, 40 GE QSFP+ with 4x 10 GE fan-out, 10/1 GE SFP+ appliances. VM version with support for Vmware ESXi and KVM hypervisors. No add-on licenses. Simple device-based license for all functionality. REST API for test automation. FortiTester appliances offer enterprises and service providers a cost-effective solution for performance testing and validating their network security infrastructure and services, providing a comprehensive range of application test cases to evaluate equipment and right-size infrastructure. All test functionality is included in one simple device-based license. FortiTester provides powerful yet easy-to-use test cases that simulate many stateful applications and malicous traffic. Built-in reporting provides comprehensive information about the test including SNMP stats from the DUT. It enables you to establish performance standards and run audits to validate they continue to be met. A single 40 GE appliance allows over 20 million concurrent connections and new HTTP connection rates greater than 1 million/second, hardwarebased acceleration supports new HTTPS connection rates above 20,000/second. Up to 8 appliances can be grouped in Test Center mode to massively scale performance. 40 GE device interfaces can be split to 4x 10 GE SFP+ for additional testing flexibility. 100 GE, 10 GE devices and VM versions complete the Tester range, with competitive price points for their target customers. All test cases and tester functionality, including attack traffic samples, are provided in a simple device-based license. Includes a wide range of test cases for IPv4 and IPv6 covering application and video delivery, IPsec, mobility, network services, and attack replay. Easily change test case options — for example, such as how sessions are closed, piggybacking, randomize source ports, specify SSL versions and ciphers, include payload for inline scanning and sandboxing. Adjust load parameters while tests are running. * maximum of 2 devices in test center mode for IPsec testing. 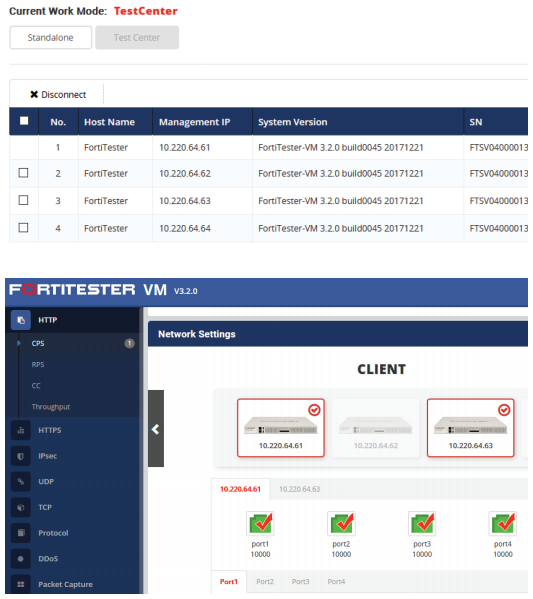 Easily configure test cases for applications, traffic generation, application simulation, and malicious traffic, using FortiTester’s web interface. The two software components in FortiTester are the traffic generator and the test center. The traffic generator is the engines, assigned CPU cores, and physical interfaces. The test center is the user interface, test cases, and system management. In Standalone mode, test center works with the local traffic generator. 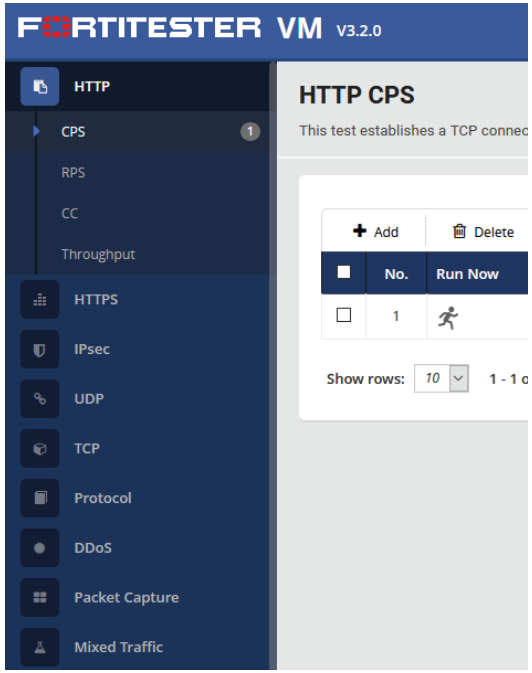 In Test Center mode, test center connects to the local traffic generator and remote traffic generators on other FortiTesters, allowing you to scale your performance testing requirements. The virtual machine version allows performance and validation testing for both physical and virtual network services and infrastructure. Ideal for customers implementing network functions virtualization (NFV) and software defined networking (SDN.) Both vSwtich and PCI-E passthrough are supported, providing flexibility and performance for vm-based testing. Furthermore, test center mode enables the virtual solution to easily scale up to 8 testers (or scale down to multiple standalone units), providing flexibility and performance. 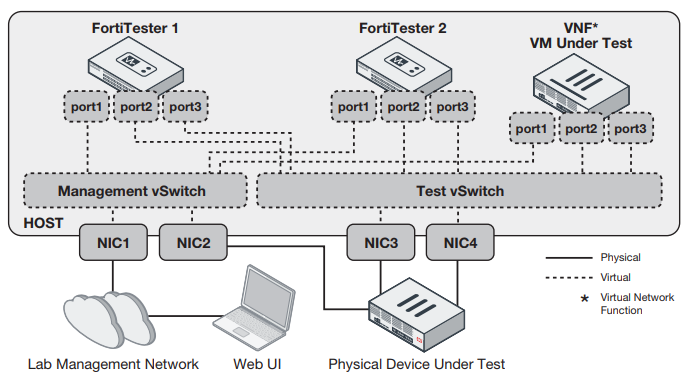 Download the Fortinet FortiTester Datasheet (PDF).